Surveyor 2 was to be the second lunar lander in the unmanned American Surveyor program to explore the Moon. It was launched September 20, 1966 from Cape Kennedy, Florida aboard an Atlas-Centaur rocket. A mid-course correction failure resulted in the spacecraft losing control. Contact was lost with the spacecraft at 9:35 UTC, September 22. On February 3, 1966 Luna 9 spacecraft was the first spacecraft to achieve a lunar soft landing and to transmit photographic data to Earth. 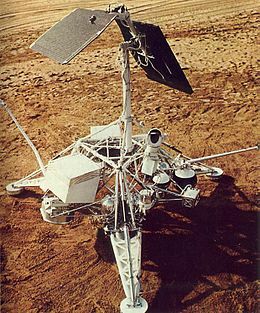 Several months after, Surveyor 1 launched on May 30, 1966; and landed on Oceanus Procellarum on June 2, 1966, also transmitting photographic data back to Earth. This spacecraft was the second of a series designed to achieve a soft landing on the Moon and to return lunar surface photography for determining characteristics of the lunar terrain for Apollo program lunar landing missions. Besides transmitting photos, Surveyor 2 was planned to perform a 'bounce', to photograph underneath its own landing site. It was also equipped to return data on radar reflectivity of the lunar surface, bearing strength of the lunar surface, and spacecraft temperatures for use in the analysis of lunar surface temperatures. The target area proposed was within Sinus Medii. The Atlas-Centaur had placed Surveyor 2 on a path to the Moon that was only 130 km from its aim point. During the midcourse correction maneuver, one vernier engine failed to ignite, resulting in an unbalanced thrust that caused the spacecraft to tumble for its remaining 54 hours. Attempts to salvage the mission failed. Contact was lost with the spacecraft at 9:35 UTC, September 22. The spacecraft was targeted at Sinus Medii, but crashed near Copernicus crater. The spacecraft was calculated to have impacted the lunar surface at 03:18 UTC, September 23, 1966. Its weight on impact was 644 lb (292 kg), and speed was about 6000 miles an hour (2.6 km/s = 5840 mph), slightly over lunar escape velocity (2.4 km/s) and similar to the impact velocities of the Ranger program spacecraft. The next Soviet mission, Cosmos 111, was launched on March 1, 1966. The mission was also a failure. Surveyor 3 soft-landed on April 20, 1967 at the Mare Cognitum portion of the Oceanus Procellarum. It transmitted a total of 6,315 TV images to the Earth. 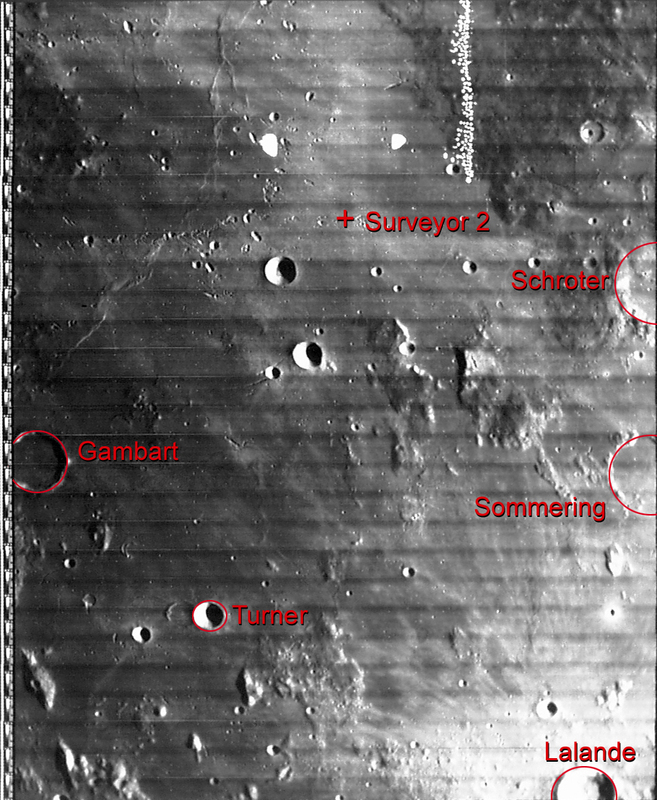 There were seven Surveyor missions; five were successful. Surveyors 2 and 4 failed. Each consisted of a single unmanned spacecraft designed and built by Hughes Aircraft Company. The precise location of the Surveyor 2 crash site is unknown. ^ "Central Moon Landing Try for Surveyor 2". The Deseret News. 19 September 1966. Retrieved 2009-11-15. ^ "Surveyor 2 on way". The Age - 21 September 1966. 21 September 1966. Retrieved 2009-11-15.